Attorney Richard J. Fuschino, right, speaks with his client David 'DJ' Creato, Wednesday, July 5, 2017 in Camden County Superior Court. Judge John T. Kelley set Sept. 11, 2017 as the start of Creato's retrial on murder charges. The retrial of David "D.J." Creato will begin on Sept. 11. New Jersey Superior Court Judge John Kelley announced the new date at a brief court hearing on Wednesday. 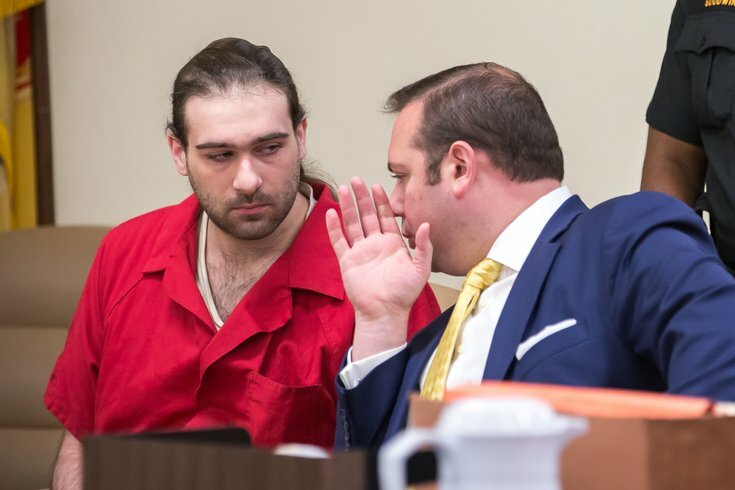 Creato is accused of killing his 3-year-old son, Brendan, in October 2015. The boy's body was found in a creek bordering a Haddon Township park, less than a mile from the apartment that D.J. Creato's shared with his toddler son. Creato's first trial ended May 31 with a hung jury. Ten of the 12 jurors were ready to convict Creato of first-degree murder, according to a juror who spoke afterward with PhillyVoice. The jury never conducted an informal poll of the child endangerment charge that Creato also faced. Prosecutors allege Creato killed Brendan to maintain a relationship with his girlfriend, Julia "Julie" Stensky. But the defense raised questions about the medical examinations of Brendan's body, alleging the Camden County medical examiner failed to follow investigative protocol. Creato, who did not testify, told investigators that he woke up on the morning of Oct. 13, 2015 to find the boy missing from their Westmont apartment. Creato remains in custody on $750,000 bail. Staff photographer Thom Carroll contributed to this report.